"Yes... these heartless are capable of being... different, though I would not want to lower my guard around even the well-mannered ones. I've yet to meet one who didn't immediately attack, or have some ulterior motive when making contact." She was still bitter of the heartless since they were the reason why she and her friends were forced to evacuate their world when they could have stayed to defend it. Back then, they were already fighting a battle against two other forces, and with them mixed in, they were close to losing their world. Much of the damage could not be healed, and that was a wound that would need a lot to start healing. While waiting for Annabeth's next question, Isis removed her cape and neatly folded it before placing it beside the pillow. It was going to be a long tip, so she decided to settle in a little and lay down on the bed they were allowed to use, but it was hard to get comfortable with her metallic headgear. She removed it and placed it on top of her folded-up cape, though curiously her eyes were shut. Isis held her hands in front of her and a darkish glow appeared, bridging across her palms, which soon solidified into a black cloth-like strip, which she then used to blindfold herself before laying her head on the pillow. The blindfold covered just about the same surface area as her metal one. "The bed's actually quite comfortable," she remarked before turning her head towards Annabeth. "It's still your turn to ask me a question, by the way," she'd say with a soft smile. It was clear that Isis wasn't fond at all of the Heartless. Though she said not long before that each was an individual, she seemed to see them as either beasts or tricksters. "If you say so," Annabeth replied, choosing not to push the question. It was strange that Isis was so opposed to the Heartless, since she seemed to exude that same warmth they did. It was something Annabeth had gotten used to feeling- Just another trait that some people had and others didn't. The only ones who consistently bore that warmth were the Heartless. In a way, however, her hostility made a kind of sense. The Heartless were individuals, but just like any human being, there were just as many unsavory ones as there were good. Even Annabeth had a habit of forgetting that the latter existed, and these thoughts reminded her of the better people she'd met recently. How was Ryley doing, anyway? Seeing that her friend had begun settling in proper, Annabeth decided to do the same. She undid a latch at the back of her collar, revealing a zipper to open up the back of her coat. It stopped at the rim of the metal skirt, but at that point it was just a matter of stepping out. She draped it over the rail at one end of her bunk, taking a moment to roll her now-bare shoulders. Beneath, she had been wearing a simple, sleeveless tank-top shirt that bore no interesting colors or logos, and it was undeniably more comfortable than the entire get-up. She was reminded that it was her 'turn', and tried to think up another question as she dropped onto the bunk, choosing not to bother with her boots just yet. "I am a bit curious..." She considered asking about Isis' tendency to conceal her own eyes, but decided, once again, not to pry. After all, people could get pretty sensitive about those kinds of things, and she'd seen just how volatile one can get in these new Worlds. "...Uh... Why the cape, eh? Some kinda cultural thing, or is it just your sense of fashion?" "Oh, the cape?" She was surprised that that was what was being asked. 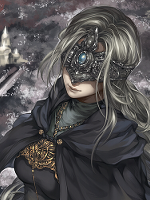 Usually, people would ask about her mask or blindfold first. "It's comfortable and... makes me feel... safe. I know its just a piece of cloth, but it does a lot to keep me from feeling exposed, especially since I'm not around the person I usually hid behind years ago. It also keeps me warm in cold weather, and give me some protection from the sun in hot weather." With a chuckle, she decided to finish off with, "But I guess the reason why I always have it is that I consider it my lucky charm, if you buy into that." She was aware that this was a childish thing to think, but it wasn't like it hurt anyone. She turned to her side to face the other woman in an easier position so she wouldn't have to crane her head too much. "Do you have anything you consider lucky?" So it was a luck thing. Sure, Annabeth had been pretty lucky so far, in some ways, but she couldn't quite tell if there were any objects that had made the difference. "Can't quite say I have anything really 'lucky' on me," she admitted. "I just call the coat lucky 'cause I don't have any better title for it." With that in mind, she realized that, in a reality of fantasy in the like, she really should put more thought into the names of her equipment. After all, everything had its own drawn-out title in those sorts of stories. Even in a place like this, Isis spoke of it as if it were a childish thought to have something around for extra luck. "Don't be so skeptical about it, buddy. If things like magic are a regular thing 'round these parts, then it isn't all too strange to think luck takes part in things too." From the talk of luck and coincidence, her thoughts turned to the subject of the strange happenings in recent times, primarily her having gotten there to begin with. She still had no idea what, exactly, had given her the chance. It had obviously been some kind of magic, seeing as just about everything tied back to magic of one kind or another, but she couldn't think of anything that could've set it in motion. "On another topic," she shifted slowly, "do you know if there's anything around these worlds that would just... Oh, I don't know, randomly open a portal linking the nearby space to a planet completely unrelated to these ones?" She paused to give time for an answer, though she could tell that the question she'd hoped to pose as hypothetical had gotten a tad bit too specific to come off as intended. There was also her unintentional use of 'planet', rather than 'world', which she'd learned was a pretty clear difference between her own dialect and that of the locals. Perhaps it wasn't too much of an issue, seeing as she was clearly a foreigner anyway, and this person seemed trustworthy enough. "Perhaps there is some truth to it, but there will be some who would think your luck can't be changed with a simple item. It's still fun to think about it though." Isis thought about the random portals. It was something that she had worried about since the first time she jumped into an unknown one to save her skin. Was it the World that made that? Someone who was part of the attack of her world? Or maybe it just appeared due to someone mistaking a spell? She had no solid answer, but whatever it was, the fact that it appeared near them, it could be attributed to luck. "There might be. I know some people are capable of making portals, corridors, gates, or whatever variety of them. It may be possible that there are some naturally occurring ones, but its difficult to say if it was natural or not." The seer had run out of things to ask the woman about. What else was there to ask? Actually, a lot of things, but none that currently interested her, or it didn't actually blended well with what they have been talking about. So, she simply and finally just asked, "Where will you be headed once you have your ship back?" "I'll probably be chasing after those Heartless," she admitted. Sure, she'd been kicked out the first time, but that was a fluke- A pure coincidence as a result of that rude red guy being there. If she were given a proper chance, she was sure she could bring down something so small. It was just a matter of no being caught off-guard by interruptory nonsense. This was a glorified kitten, after all, and she had a glaive and fire. That'd was, like, two whole layers of better, right? Right. However, there was something Annabeth couldn't ignore about Isis' last statement. "So you mean those are made by people?" she pushed. "It's not some kind of magic glitch?" She could easily accept that it was another coincidence, but with the possibility that someone had intentionally opened the portal on the table, that only brought more questions, specifically as to who opened it and why. Did someone have reason to remove her from Oasis? It seemed unlikely, but the idea bothered her. "Chasing down the heartless?" she echoed. She wouldn't be the first to say something like that, and definitely not the last. Isis had no sway, or rather, she had no right to sway that decision. One because this person was on their own path, and two, it would be hypocritical of her to do so. "May your karma keep you safe." Because if she lost her heart to the darkness, then she and Isis would have problems in the future. "I'm not saying all of them are, but... there had to be agents to create something like it. A glitch might be possible. So is an unintended flux of magic on certain volatile points. There's still much I have to learn, and... some people have already opened similar portals using machines, so now the possibilities have just expanded. But... there are ways to know what created the portals. Magic is manipulated in ways that differ between everyone, and those who are sensitive to these can retrieve a signature from the remnants of the space around the portals, or pretty much anything that has to do with magical energies. I'm sorry, I don't think I've answered your question, have I?" Annabeth turned and let herself fall onto the bunk, where she bounced once before coming to a proper rest. "Sounds complicated enough that trying to answer it might not be the best idea," she commented. "I've probably got some reading up to do somwhere, is all." Studying things out of necessity had never been one of her strengths, unfortunately, and she was hoping to pick up knowledge through experience alone, but she owed herself a stop in one of the more secure worlds to stop by a library. If there was really so much to consider concerning the portals alone, there was no telling what other bits of common knowledge she might have been missing. Answers or no answers-" She cut herself off with a yawn she'd felt coming for some time, "I say we cut it here and get some rest before we get to Aggrowhatsit..." She rolled away on the spartan bedding, having decided that their energy would be better reserved for when they might need it. The Heartless she'd seen in Agrabah hadn't been taken care of when she was removed, so for all she knew they were still there causing a ruckus. It was among the several things left on her proverbial checklist of things she still needed to do, right next to finding the Venture II and learning how to play a harmonica. "Agrabah," Isis corrected. Yes, it might be best for them to rest up for when they arrive to their destination. Isis wasn't going to rest just yet, she wanted to talk to the pilot for a while, mostly to arrange for compensation of her services. "You rest up, I will just need a moment with the captain." She got out of bed and went to seek out the pilot, leaving her mask and cape where they were on her bed. "Just call if you need anything," she said before walking off. She watched as Isis stood up and left the room. "Will do," she replied simply before leaning back into the bunk once again, closing her eyes proper. She made a conscious attempt to avoid paranoid thoughts about what, exactly, this new friend might be discussing with the pilot. Annabeth Lee-Clement has left the world. Isis Evita has left the world.